Harry Potter fans been hype for this movie since word dropped that it was coming. A lot of us saw a golden opportunity in Fantastic Beasts, set to traverse the US instead of the UK: the chance to see ourselves in the Wizarding World. Fan casts of Newt Scamander, a character with no physical description, expressed the hopes of Potter heads of color everywhere. 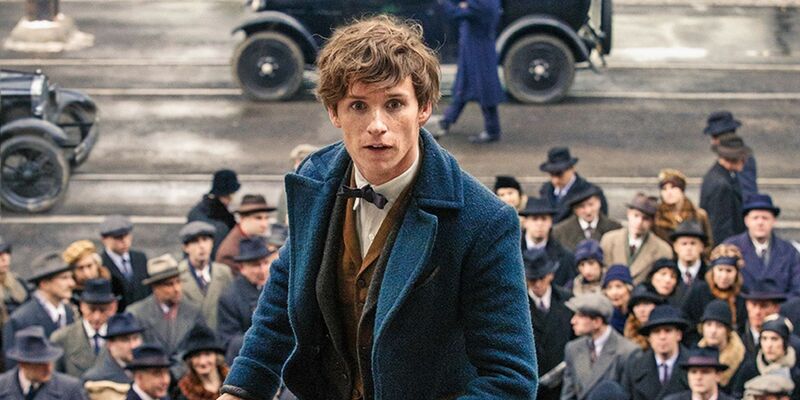 When Eddie Redmayne was cast as the magizoologist, we kept hope alive. As more casting was announced and the film remained white as a reddit forum, we kept hope alive. When Rowling released her problematic History of Magic in America and even worse History of Ilvermony, we kept hope alive. Because surely no one visits New York City, even in 1920, and only sees white people. Impossible. Well, Rowling always shoots for the exceptional in that Fantastic Beasts and Where to Find Them gives us the toilet paper white New York City of Trump voters dreams. The New York that Friends sprung out of…yay… So yeah, those representation dreams are dead, so don’t go in expecting ANY of that. Director David Yates and writer J.K. Rowling understand the world they’re playing in completely and thoroughly. And perhaps that’s where the main issue lies. Fantastic Beasts feels and looks the same as the last few films in the Harry Potter canon. 1920s Wizarding New York looks just like 1990s Wizarding London. New characters, a separation of 70 years, and a whole new country do little more than give us a few more vocabulary words and acronyms. Lord, these acronyms. Rowling’s script meanders its way through the story at a novel’s stroll. The two and a half hour run time feels like an extended Universal Studios ride. Or, to borrow from another park, it’s the Harry Potter equivalent of a Haunted Mansion or Pirates of the Caribbean. You get the briefest sense of danger but it’s mostly about looking at all the pretty things. We spend plenty of time scrolling through a laundry list of magical creatures without gaining any in-depth knowledge about them. The plot twists (awkward jerks really) can be spotted a mile away despite enough red herrings to have a church fish fry. Fantastic Beasts does manage to impress with its visuals. Director of Photography, Philippe Rousselot, pulls some stunning shots. Really this and the special effects add flash to an otherwise meh film. Our introduction to the MACUSA offices sprints us between the building’s No-Maj (the American equivalent of the term muggle) entrance and the Wizard one in dizzying fashion. If the plot moved at this pace, it would’ve given us a much better movie. The core cast puts in solid performances. Eddie Redmayne’s obnoxiously oblivious and self-centered Newt grows on you as he starts to realize his poorly-made decisions actually affect other people. Dan Fogler’s Kowalski is a lovable cinnamon roll who makes delicious cinnamon rolls and deserves only wonderful things from life. Alison Sudol, as traditional 1920s dame Queenie Goldstein, gets a lovely amount of time to shine and show her depth. Colin Farrell is blatantly suspicious as Graves and Ezra Miller is too big of a name to be anything but important to the plot as Credence (also those asymmetrical bangs…y’all know I have a thing about an asymmetrical bang). There’s also an egregiously tone deaf if unsurprising commitment to whiteness in this film that’s impossible to understand. No-Maj New York is exclusively, completely, and thoroughly white. Even Trump rallies had a spot of color or two. Wizarding New York is more diverse but only in the background. Three non-white characters get to speak and while it is satisfying that they’re all women, it’s not enough. President of MACUSA, Seraphina Picquery (a featured cameo played with regal grace by Carmen Ejogo), does little more than posture and talk. By the time we got to the underground speakeasy and the Black-coded goblin jazz singer only my lack of a projectile kept me from flinging something at the screen. Overall, this film is a nice escape back into the all the familiarity of the Wizarding World. Great if you fear change but if you’re looking for depth, fresh eyes, or diversity, this ain’t the film for you. Get ready for four more of these and Rowling’s special brand of Christian, Anglocentric worldbuilding. What ticked me off was that one of the very few black characters was the only character to speak ungrammatical English. Why did the black, MACUSA operative have to speak poorly? I’m guessing that in order to work there she had to have graduated from the American wizarding academy therefore she was an educated woman. So, why couldn’t she have spoken like everyone else, i.e, correctly? Also, I was a confused by Carmen Ejogo’s head wrap. When they went into the speakeasy and I saw the singing goblin (or whatever) with the elongated head, I wondered if that what Ejogo’s head wrap was covering up. Was there some significance to her head gear or was it just a (poor) fashion statement? I could tell from the promos and trailers that this was gonna be a HUGE problem for me. Seems I wasn’t wrong. I’m sure Rowling will turn around and after-the fact make someone black or gay and people will praise her for it. Bleh. In some ways she’s worse than the villain- because at least the villain was antagonistic due to his own schemes and intelligence. She was an antagonist due to her stupidity and arrogance stopping her from seeing the bigger picture. Ugh, I hope the next film’s better, but since Lupita LeStrange sounds like she could be the new Black Cho (and already placed as inferior to Porpentina), hopes are not high.